During the screening of the MasterChef South Africa 2013 series, TV viewers were both fascinated by, and impressed with, the Van der Wat sisters. 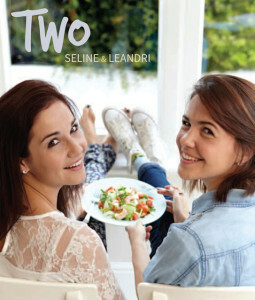 Seline and Leandri’s relationship and their varying cooking styles and personalities kept audiences on the edge of the seat right up until the final episode as they were ultimately placed second and third – no mean achievement. Since then their foodie careers have taken off, albeit in differing directions. But in TWO, they are back in collaboration to present a really fascinating cookbook concept: taking the same main ingredient and creating two different dishes from it, or taking a classic recipe and making one for family and casual dining, and the other version to impress for serious entertaining. Whatever the case, both dishes will be utterly delicious. So, for instance, take a straightforward Pea Soup. The basic recipe is Pea and Fennel Soup with Goat’s Cheese and Lemon Oil – wonderful for a weekday meal.